Thanks to our wonderful sponsor! UDEN's 10th membership meeting kicked off at the incredible surrounding of Utah's Natural History Museum. The evening was generously sponsored by the Entertainment Arts & Engineering Master Game Studio at the University of Utah (big thanks to Prof. Bob Kessler and Corrine Lewis! ), including some terrific food supplied by Le Croissant. 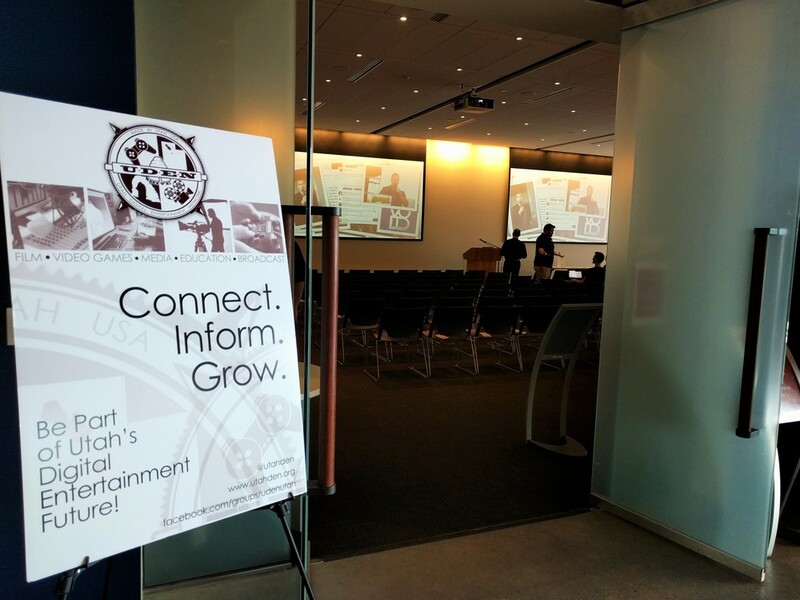 About 120 people attended to hear the latest UDEN news, listen to the presentations and to network with the movers and the shakers of Utah's digital entertainment industry! After some openings remarks from yours truly, we moved to Hive Ignite -- 3-minute speed pitches from members. First up was Arthur Eby aka Ask Arthur on YouTube. He explained how he uses the medium of YouTube to make the teaching of science more engaging for students. He showed one of the films from his site, about The 5th Element and it was fun to observe him mime along with the words as we all watched it! He said he had to rehearse it so much he still remembered it! Next up were Greg Bayles and Jon Kenkel from Gallery9Games. They previewed their student project from the EAE program, called Reload360, a fast-paced arcade shooter that gives players the ability to see everywhere around their location - all 360-degrees - at the same time! Mind blown! This experimental gameplay needs support and they were asking for us all to go vote for it on Steam! Last but by no means least, we met Issac Goeckeritz, a prolific documentary film maker who is on a mission to record powerful stories that spread positive influence, that can inspire lives and change the world. He showed us a film from his impressive body of work that he took several years ago -- a group of Kenyan boys during a school recess in the Masai Mara, getting joy from a game of soccer improvised with a ball of discarded shopping bags! Issac implored us all to use the remarkable personal recording devices we have in our pockets - our phones! - to record more of life's precious moments. "Roger Altizer has been very much the public face of the Master Game Studio at the EAE program at the University of Utah. He has been a staunch advocate of gaming in Utah and the practical applications of using this entertainment medium for learning and social benefit. Roger has inspired many students in the award-winning programs he helped to create; challenging their assumptions and pushing them to achieve more than perhaps they believed possible. In addition, he has been a terrific partner for those of us in industry locally." "To make things worse, he is a nice guy. He has a weakness for convertibles, pedicures, Hawaiian shirts and ill-advised head-wear. What else can I say about Roger that he hasn’t already said? Please join me in welcoming one of the brightest stars in Utah’s digital educational universe, Sir… Roger Altizer!" in the download age, there are many distribution options, and EAE students have been published on just about all of them! 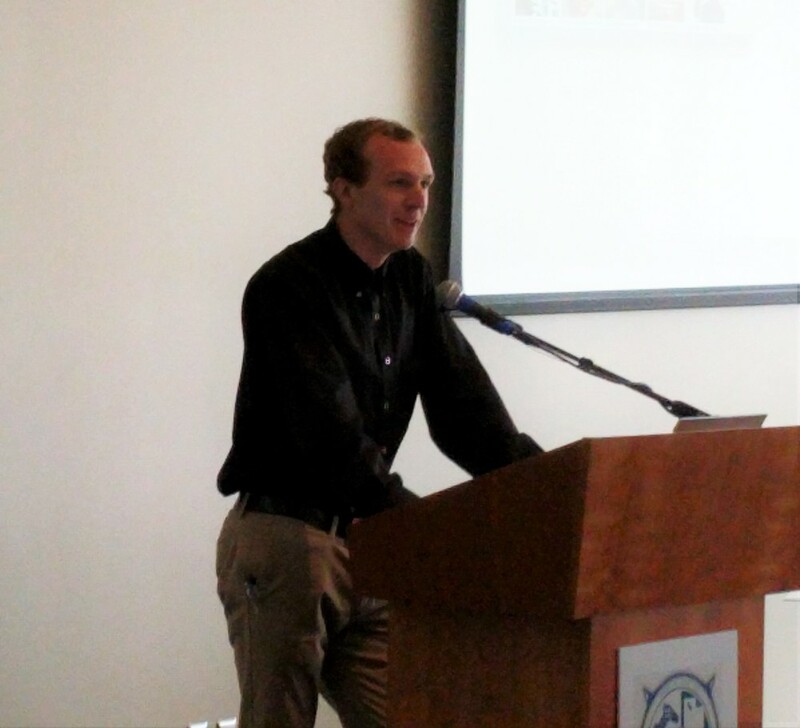 Roger wrapped up his presentation by imploring the local community to reach out the U for their students; they are smart, qualified and make great QA candidates even better interns and full-time are of a higher standard than entry-level or junior. The U is also available to partner on commercial research projects and have done so quite successfully for many years, including on serious game applications. He concluded by inviting everyone to the EAE open day next week. He then took 15 minutes of Q&A which was also very informative, as he responded to questions on serious games, gamification, application to film, publishing relationships locally and more. I then announced our next meeting and reminded everyone that if they would like to present in Hive Ignite, our 3-minute speed pitches, to drop us at email at info@utahden.org. In addition, a reminder that we’re always looking for speakers, sponsors and venues – so again please do get in touch! I added some commentary about the website, noting that our ‘Events’ page includes, quite radically, upcoming events! We went through a few of them from the events page, including Spy Hop's 2016 benefit, EAE Day and IGDA's May meeting. "There is a lot going on in our community, a lot more than I have mentioned here. And this is the point - we need your help. If UDEN can be a central point for all of the events that are going on, it means more people will know about these events. It means that more people will show up at these events. It means we’ll become a better functioning community. I keep coming across events that our members are putting on, and asking them to please post it on the UDEN website. It’s free, and we have a big audience now, an audience that wants to know about your events. It takes about a minute to add an event, so, please – help us help you and the community we’re trying to build. Please do add any events of yours, or that you know about that might be of interest to our members. And if you really can’t manage a mouse, please do drop us an email and we’ll add them for you! The website is a pretty powerful tool. In addition to setting up and managing events, you can become a member for free – as an individual, a group or a company and get a bio listing. You can add open job postings on the job board. You can also look for open jobs. And you can share your thoughts, ideas and expertise with our members using the blogging system. If you would like to see the website do other things – please tell us. We want it to be a useful tool for this community." "In this room, like at every meeting, we have all of the skills, services and expertise needed to make award-winning digital entertainment – so please do make a point of going up, talking to other people who are here. Through networking we build a community. Like I say at every meeting – don’t be shy. This is a great opportunity to meet and network. To help break the ice, tonight I want you to go up to someone you don’t know and say “You look fabulous! What fabulous things do you do?”"
So it was that people were using the cheesy line for the rest of the evening! 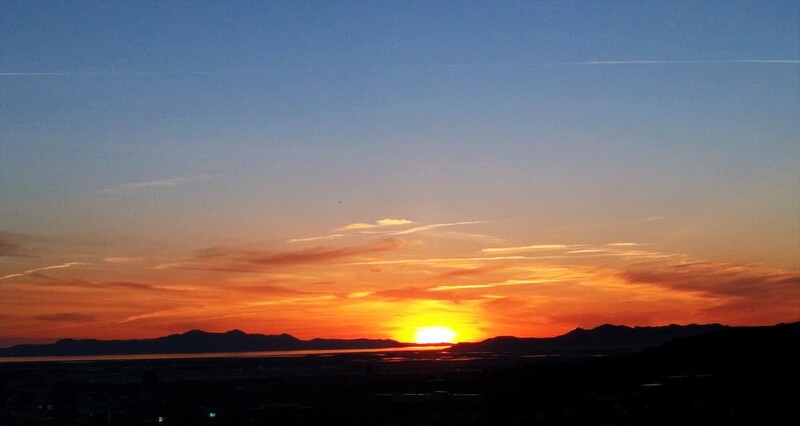 It ended with a bunch of people watching the sun go down over the Great Salt Lake, on a glorious warm evening! Great night! Video of the event will follow... in the future! UDEN#20 - Virtual Studio + Best Networking Ever! So.. You Want To Be a Game Producer?